This interview with the artist Allan Anderson was contributed by Laura Vahlberg. Laura is an artist from Alabama, whom I met last summer when I was painting in Italy. Enjoy! I am honored that Allan Anderson agreed to this email interview and thank him greatly for being so generous with his time and attention, sharing thoughts about his art and process. 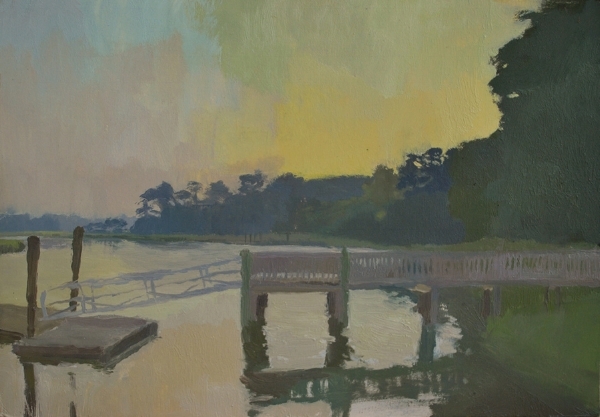 Allan Anderson is a landscape painter living in Columbia, SC. 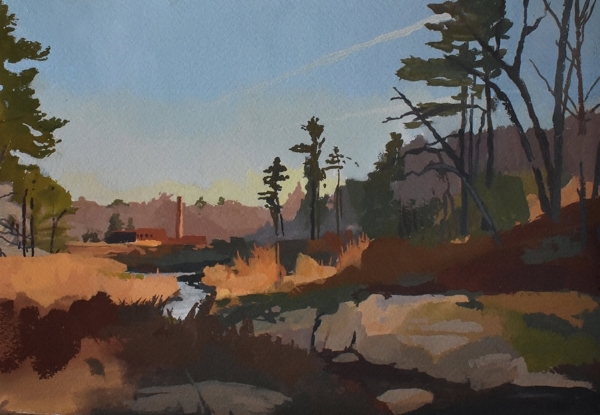 His work in the landscape was most recently shown at the 2017 National Juried Painting Exhibition at the University of Southern Mississippi, juried by painter Peter Van Dyck where he won Best in Show. He is also an art teacher at a local high school in Lexington, SC. Laura Vahlberg: Hi Allan, Thanks for agreeing to this interview! So how did you get started with becoming a painter? Allan Anderson: Hi Laura, Thanks for asking. I decided to become a painter after my first landscape class at the University of South Carolina. Before that, I had never painted. I always loved art and always drew but never thought I could do anything with it. I actually discovered painting while I was in the Art Education program at USC. It was during the landscape class that I decided to change my major. At first, I think it was the challenge of painting that attracted me. The more I painted, the more it became about something much bigger and I knew that it was something that I needed in my life. I was consumed by painting and made it a priority to learn as much as I could about it. Once I was committed, the rest was laid out for me and I had wonderful mentors to help me along the way. LV: I really like what you said about painting becoming about something much bigger. Can you tell me more about that? Also, can you tell me more about your mentors? 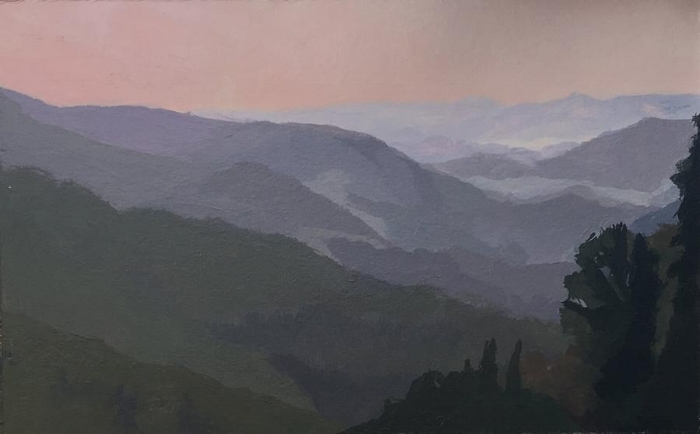 During my second year of painting I was very fortunate to get a scholarship to the International School of Painting, Drawing, and Sculpture in Monte Castello, Italy. I was immersed in the classical landscapes that were painted by the same master painters I had been studying. There is something special about the landscape in Italy. It teaches you to paint. It was there where I began seeing differently and thinking differently about nature and the landscape around me. As I painted and studied painting constantly, I developed a painter’s lens. I look at everything differently now. My brain is always finding connections of shapes and color. I am always painting in my mind throughout the day, even when I can’t find time to actually paint. So I guess when I say painting became much bigger, I mean that it became an integral part of my life. It became something I needed. Painting represents peace and solidarity to me. It is hard to explain, but when I am painting, I feel a sense of happiness and wholeness, like everything is full and perfectly satisfied in my world. The things that make me most happy in life, such as my family, fuel my passion for painting. I always say that without those parts of my life I wouldn’t be able to paint at my highest level. Having that solidarity allows me to paint in a very natural way. It is a very sincere and profound experience. As far as my mentors, I contribute much of my growth as a painter to Blake Morgan and Brian Rego. They both taught at the University of South Carolina during my undergraduate studies. I met Blake when I took his Intro to Painting course. At that time, I was taking a foundations course with Brian. I didn’t realize then that they would have such a large influence on me. Both are good friends of mine now and will laugh when they read this, but I think it is understood that if it weren’t for them, I most likely wouldn’t be painting. Blake was the reason I started painting. He taught me the basics and encouraged me to keep going. He introduced me to many things, such as materials and processes, as well as painters to study. He introduced me to Stanley Lewis, who I still study often. That guy knows painting! Brian gave me my first easel. He had a lot of influence on me in the landscape and how I handle my paint application. I was very fortunate to spend a lot of one on one time just painting and having critiques with them. Looking back, it is pretty incredible how much time I was able to have with both of them. There were many sessions where we would set up right beside each other and paint the same subject. I did a lot of figure painting with Blake and landscape painting with Brian. As intimidating as it was to work directly beside them, it was very constructive to my growth. I feel like those sessions helped me develop faster. There is so much more that can be said about what I learned from both of them and what I am still learning from them today. I have been painting for six years. As far as I’m concerned I am still a young painter. I don’t really know what I am doing half the time. I just know that I enjoy it. I try not to over think it and to paint as naturally as I possibly can. LV: Can you talk about your process? How do you go about making a picture? AA: I tend to paint ordinary places that I see often; typically somewhere I pass daily. You can find beauty in anything. When I said that I am always painting, I really am always looking at everything in relation to painting. I see good paintings everywhere. I don’t have much of a planning process anymore, but I look for places that are appealing to me. It usually involves the way the light affects something at a certain time of day, or the way objects line up with one another. I am very interested in the relationships between shapes in my paintings and how they share the space within the picture plane. Often times I paint in places that I pass daily on my commute. If I see it enough and think about it enough, I eventually stop for a closer look. I can’t remember the last time I sketched or planned a painting beforehand. I used to draw things out first, but now I just go for it. I may use a viewfinder for a few minutes while I look at composition, but after that I begin blocking in color. This led me to using more paint, which brought up new discoveries and new obstacles. I have learned the value of a palette knife and the ability to scrape. I focus a lot of attention on paint application and mark making. I try to have at least two to three colors and various brush sizes going at one time so I can maintain sincerity to my edges. These things are important to me but in the end I honestly just do my best to paint what I see in front of me. The things I leave out or invent just sort of happen naturally. Recently, I am trying out another approach. My studio has always been more of a place to store my paintings and materials than a place to paint. One of my many goals is to find ways to work in my studio more. I discovered digital painting around the time my son was born and I have been working from them in the studio. I think I got the idea from painter John Dubrow while I was browsing some of his posts. I started experimenting with it on my phone. At first it was an attempt to keep my painting needs met during such a hectic time but I quickly discovered the possibilities it allowed and moved to an iPad. I am still new to painting from them in the studio but I think it will serve as a useful tool while working on my larger paintings, especially those that involve figures. LV: Do you use photo reference in your work? AA: I don’t use photographic references but I am not against it. It doesn’t work for what I want to do with my paintings. A lot of what I am attracted to involves natural light or the way something looks in its own space. That is why it has been a struggle for me to paint in the studio. Working from digital paintings is slightly different because it is still painting from observation with my iPad. With those, I have noticed more intensity in color to some degree because it is digital, but it is still more natural than a photograph. I believe skilled painters can use photographic references; I am just not there yet. Ideally, I would like to take photos of places when I travel and be able to paint them back home. I sometimes paint small studies when we travel and take many photos while I paint in plans of working in the studio. When I try to do so, I can never get the color that I want. So I guess the best answer is, I would if I could. I think that is why I talk so much about being in nature and painting in a way that feels most natural to me. I am most comfortable out there, and it just kind of happens for me. I would add that I believe it is fundamental to paint from life and direct observation if you ever plan to work from photographs. There are certain skills that can only be obtained when working from life and there is too much to understand about space and color that can't be found in a 2 dimensional photograph. LV: You mentioned Stanley Lewis, do you ever piece canvases or paper together the way he does? AA: I have. Piecing things together is always an option. My surface choice has a lot to do with it. For me, paper is much easier to piece together than anything else. I believe Stanley is able to piece things together effectively because he has refined such a personal approach to painting and how he treats the surface. Something so personal can only be developed through time. He also uses an abundant amount of paint. I would love to be that confident and vigorous with my application. I always think about working that way, but never do completely. Piecing things together for me works occasionally and is always an option that I keep in my back pocket. I’ve also cropped paintings down. The painting that placed in the Mississippi show was actually twice the size but I wasn’t happy with the right side. Sometimes you have to know when to let go. Ultimately you have to make decisions for the better of the painting. If adding or removing something will help the painting, I believe it is necessary. LV: How do you respond to changing light and changing seasons while making a painting? AA: Part of the thrill is chasing the light each session. Every time you set up to paint is different than the next. You have to be willing to paint over everything if the painting needs it. Painting over something you like is such a challenging lesson to grasp but is essential for learning to paint the landscape. You have to keep it fresh. A great aspect of painting from life in these situations is that things do change. When they do, you find new connections of shapes and color that may make for more intriguing compositions. The downfall of painting from life is when seasons change; you may have to put a painting away for a while. I believe this is beneficial in a way because it gives you a lot of time to look and reflect on what works in the painting. I do have one very large painting of my backyard that has been around for two years. It is late summer just before fall. I am excited to work on it again now that my son is walking. I plan to paint him in there this summer. LV: How long do you typically spend on a painting? AA: It varies. My one-shot paintings often work out better than my longer, thought-out paintings. One session is usually three hours. I work four hours if I am lucky. The light changes a great deal within four hours, especially during the times that I paint; usually the mornings or evenings. On average, my multiple- session paintings usually accumulate around thirty hours. I tend to slow down with lengthier paintings. LV: Do you have any reading recommendations for the practicing painter? Dunning, William V. Changing Images of Pictorial Space: a History of Spatial Illusion in Painting. Syracuse University Press, 2010. Hawthorne, Charles Webster. Hawthorne on Painting: from Students' Notes Collected by Mrs. Charles W. Hawthorne ; with an Introduction by Edwin Dickinson and an Appreciation by Hans Hofmann. Dover Publications, 1960. Loran, E. CeÌ Zanne's Composition: Analysis of His Form with Diagrams and Photographs of His Motifs. University of California Press, 1970. Pissarro, Camille, and John Rewald. Letters: to His Son Lucian, by Camille Pissarro. Kegan Paul, Trench, Trubner, 1943. Thank you so much for inviting me to do this interview! I always enjoy discussing painting. Further reading includes "Ten Tips on Painting," another guest blog post by Laura Vahlberg.